NOTE: The Chris Larson benefit at Grafton's Federated Church and the sports jersey raffle have been held, but the fund remains open for donations to help Chris. The Grafton native and Class of ‘07 graduate has been a popular "voice" of area extracurricular, high school and college sports, plus a D.J., singer, lay minister and more — all while living since birth with paraplegia caused by spina bifida. Chris, 28, has faced worsening health issues since early 2015, and he nearly lost his life in late summer of this year. He's lived in a Mayville care facility to help handle pressure wound management and positional needs. But for more than three months, he's been in a Fargo hospital. Help Chris regain his mobile, independent and purposeful life. 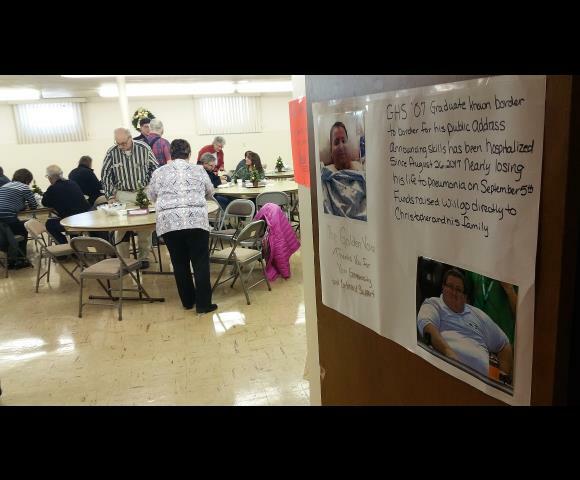 A potato bar and bake sale benefit will be held from 11:30 a.m. to 2 p.m. on Sunday, Dec. 17, at Federated Church United Methodist, 702 Griggs Ave., Grafton. The potato bar will cost $10 a plate. Proceeds from the benefit and general fundraiser will be used to help Chris purchase his own power wheelchair and help him with other transportation and general living expenses. Another fundraiser for Chris is planned using sales of raffle tickets at two sporting events: the UND-Mayville State women's basketball game at Betty Engelstad Arena in Grand Forks on Tuesday, Dec. 12; and the Grafton girls and boys basketball home doubleheader vs. Midway / Minto on Thursday, Dec. 21. The raffle tickets -- $10 each -- will provide a chance to win signed 2017-18 college sports jerseys: a UND men's hockey jersey, a UND women's basketball jersey and a Mayville State women's basketball jersey. Freewill offerings to help Chris also will be accepted at these events. Posters for both of these events appear on this page. NDAD is the official custodian for funds raised to help Chris Larson in these two fundraisers. Donations for Chris also may be made online, using the donation button displayed at the top of this page.